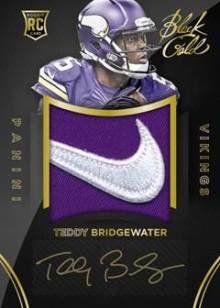 Sports Cards Plus Store Blog: 2014 PANINI BLACK GOLD FOOTBALL DELIVERS SOME OF THE BEST LOOKING RC, PATCHES AND AUTOGRAPHS OF ODELL BECKHAM, TEDDY BRIDGEWATER, SAMMY WATKINS, DEREK CARR AND MORE! 2014 PANINI BLACK GOLD FOOTBALL DELIVERS SOME OF THE BEST LOOKING RC, PATCHES AND AUTOGRAPHS OF ODELL BECKHAM, TEDDY BRIDGEWATER, SAMMY WATKINS, DEREK CARR AND MORE! 2014 Panini Black Gold Football arrives Friday at Sports Cards Plus, a.k.a. The Super Hit Factory and football card collecting will never be the same. I got to see these first hand at the 2015 Las Vegas Industry Summit and their beauty is beyond words. Each $180 box delivers two base or parallel cards, two autographs, dual-autographs or autographed memorabilia cards, two memorabilia or additional autographed cards and two metal logo cards. In Addition, some packs have an extra card that can be any of the above types. Just for comparison to the best football release to date, 2014 Immaculate Football has 6 Ultra-Premium Cards for a $375 retail price tag. For $360 (the price of two boxes of Black Gold), Black Gold Football delivers 16 Ultra-Premium Cards with at least 4 Autographs, 4 Memorabilia, 4 Metal Logo Cards and 4 Shadowbox Base Cards or Parallels. Can you say, "More for your money." Based on the number of base cards produced, approximately 15162 boxes of Black Gold Football were produced compared to approximately 12500 boxes of Immaculate Football. Given the price point ($180 per box), attractiveness, and collectability of 2014 Black Gold Football, these boxes should quickly disappear. Sports Cards Plus will do a 2014 Black Gold Football Box Group Break Friday (6:00 O'clock) and Saturday (5:00 O'clock) for $25 per spot with every spot getting One Random Card from a Factory Sealed Box. Call Charlie 210-524-2337 to pay for your spot.